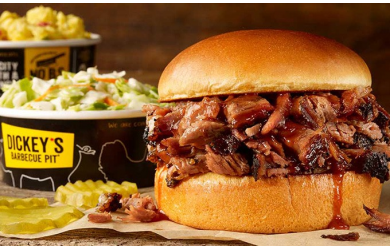 $5.00 for $10.00 - $10 of Food and Drinks at Dickey's Barbecue Pit for Only $5 - PURCHASE UP TO 5! Get $10 worth of food and drinks for only $5 at Dickeys Barbecue Pit! 3 Locations to choose from. Wide array of menu items including pulled pork, beef brisket, ribs, sausage, chicken and 12 different mouth watering sides to choose from. Choose from three different sandwich options or indulge in yourself with one of the delicious meat plates. Barbecue is an ancient American art, one that Dickey’s has perfected over the last 73 years. Indulge in some truly tasty fare with today’s hot deal from the grill kings at Dickey’s Barbecue Pit! Enjoy $10 in Food and Drinks for just $5 and get in on the best grilled treats in town before this deal is devoured! Dickey’s is the place to go, for the Tri-Cities best new BBQ restaurant! From brisket to pulled pork, you’ll taste their 73 years of barbecuing expertise in every flavorful bite. Every location smokes all their meats on-site at the restaurant the same way it was done in 1941. Dickey’s serves up beef brisket, pulled pork, ham, polish sausage, turkey breast and chicken, with an extensive array of home-style sides from jalapeno beans to macaroni and cheese. Buttery rolls are served with every meal along with the complimentary ice cream and dill pickles. And just like always, kids eat free on Sunday. Kick off the day right and enjoy some delicious on-site smoked treats and indulge in savory ribs, and tender pulled pork that’ll make your mouth water. With daily specials going on every day you can gorge on all sorts of appetizing barbecue with out even having to put a dent in your wallet. A veggie-friendly destination as well, Dickey's offers fresh salads and sides like green beans, creamy coleslaw, jalapeno-baked beans and of course, the tastiest bakers you’ve ever had! Come grab some juicy ribs fresh off the grill or fill up on the perfect BBQ sandwich with all your favorite toppings. Is your mouth watering yet? Trust us, your taste buds will thank you for grabbing today’s deal from Dickey’s Barbecue! Limit FIVE PER PERSON - One per visit. Limit FIVE PER PERSON One voucher per order. Valid for dine-in only. Promotional value good for 90 days. Paid amount does not expire. Tax and gratuity not included. Cannot be used with other promotions or offers. No cash value, full amount of voucher must be used.